Picture or photo framing business can be started and operated within the comforts of home surroundings. You can start on a sturdy table or solid work bench in a small storage area, such as your garage, shed or basement; even a small room can be devoted toward this purpose. If you are handy with tools you could be on your way to a nice sideline business that could grow with time. Many wood mouldings can be bought at reasonable cost from lumber yards and can be used as the basic product for manufacturing frames. Everyone has photos and prized possessions which need framing. Many people don’t like the plastic frames found in stores today, thus creating a ready market for beautiful, natural wood frames. 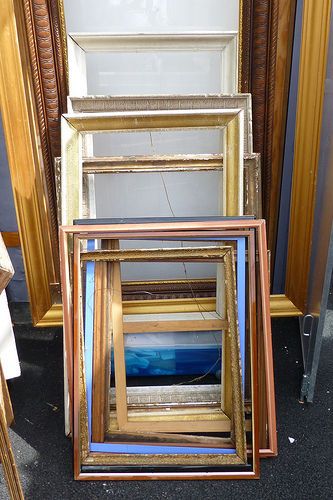 Quite often you can find old, beautiful, rugged picture frames at rummage or garage sales. They can be repaired and cut down to today’s standards. Good frames can add substantially to the value of art, paintings, posters, certificates, etc. The list is endless. No matter where you live you can start a picture framing business. To some, it can be an exciting and fascinating trade. With just a little experience and proper tools you can also learn to cut your own glass for the frames. The Internet is a great source of information on the subject. Also, in the various magazines you will find firms that offer free information on custom picture framing. Check out your local variety stores and others that handle picture frames and get ideas from what they have to offer. There are many variations and you may be able to dream up different and better designs. The frames may be sold locally or through the internet, and maybe even get you out of the everyday “rat race”! Good morning, Im a seaman for 22 years and I wanted to have my own business after 8 years from now when I retired. I have a fashioned of Arts and Home Furnitures. Any business advice is highly appreciated. Thank you. God bless.